What do dragons have a tendency to? Where did the boys go to collect the birds feathers? What are they going to use the feathers for? How many boys to each team? Where did the two deadly dragons meet? What got completely destroyed in the fight by one the Green Death's feet? How thick is the Sea dragon's skin? How can you tell when a Sea dragon is dead? In the distance Hiccup could see how many Vikings? What was Hiccup thinking while he was somersaulting through the air? Look up the word infuriating and find out its meaning. Research the origin of the word minuscule and find out what it means. 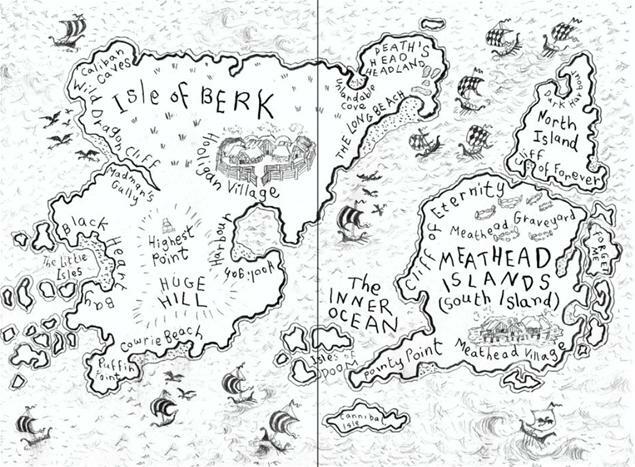 In the map below, find where the Sea dragon's fight took place.